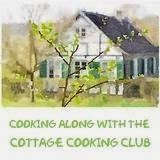 This past week, when I was supposed to be blogging about 'Cook the Book Fridays,' I was quite busy hosting my annual Camp Grandma and Grandpa adventure. On one of our very busy days, we enjoyed a visit to the Sterling Hill Mining Museum. My grandsons loved walking through the damp, dark, cold mine. They enjoyed checking out the wonders that laid beneath their feet..a geological mystery that my grandkids were quite interested in learning about. Sterling Mine is known for world-famous mineral deposits. With the help of fluorescent lighting, parts of the dark murky mine glowed in the blackness and lit up with bright rainbow colors. An excellent exploration of the minerals and rocks that make up our area. Another day was spent going to one of their favorite burger restaurants at the mall, and then hitting the dollar store. While at the mall, my granddaughter and I did a little school shopping at one of her favorite places. She picked out some incredibly cute back to school sweaters and a pair of overalls. The rest of the week was spent miniature golfing, checking out the local playgrounds and helping me in my garden. My granddaughter (who shares my love of baking) baked two batches of cookies. Oatmeal Chocolate Chip and Peanut-butter (which happens to be grandpas' favorite). She even made him an extra large one, that he totally enjoyed with his coffee. Grandpa and the kids enjoying Sterling Mine...it was a very hot day. Good thing it was only 56 degrees in the mine. Baking Oatmeal Chocolate Chip cookies...they were really good! So, here is the post I didn't get posted on time. The recipe we selected for Cook The Book Fridays (CtBFs), was Cherry Tomato Crostini with Homemade Herbed Goat Cheese from David Lebovitz's cookbook, My Paris Kitchen. I grew up on strained yogurt...in our house we call it Labneh. It was always in my grandmother's fridge while I was growing up. It was served at breakfast or as an afternoon snack with my grandmother's homemade pita. It is also a treat I usually have in my fridge. Making it is quite easy. 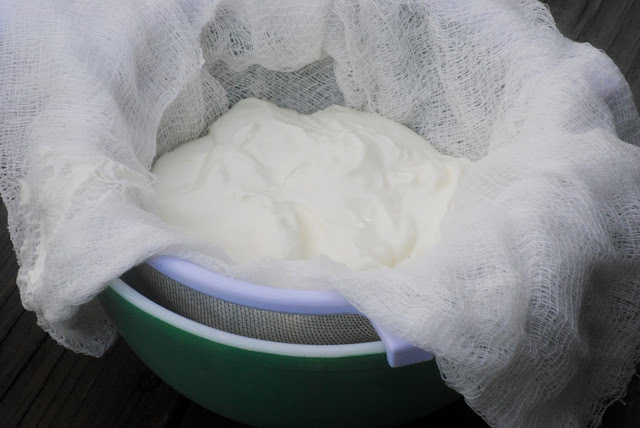 Draining yogurt in a few layers of cheesecloth, over a larger bowl, usually overnight, to produce a thick yogurt cheese. I usually add a teaspoon of salt to a 32 oz. container of yogurt. David's recipe calls for adding herbs, garlic, salt, and pepper. Very delicious!! I made this Crostini the beginning of last week and enjoyed it so much I roasted another batch of tomatoes to serve when my daughter and her husband came to pick up the kids, over the weekend. I am sure this delectable Crostini will be making an appearance at my table, all summer long. A winner for sure! A scrumptious treat…loved the freshness! Josie’s Oatmeal Chocolate Chip cookies…she set up the photo. That’s my girl! Line a mesh strainer with a few layers of cheesecloth or muslin and set it over a bowl. Scrape the yogurt into the lined strainer and refrigerate the yogurt for 24 hours. Put the strained, thickened yogurt into a bowl and mix in the herbs, shallots, garlic, salt and cayenne pepper. Combine the cherry tomatoes, olive oil, sliced garlic and herbs in a baking dish or pan that will hold them all in a snug single layer. Season with salt and pepper, mix well and spread them out in a single layer. Roast the tomatoes in the oven for about 45 minutes, stirring once or perhaps twice during baking, until their juices are starting to concentrate and perhaps brown a bit. Scrape the tomatoes and any juices into a bowl and let cool to room temperature. They can sit up to 8 hours, and improve the longer they sit. When ready to serve, make the toasts. Remove from the oven and when cool enough to handle, rub the slices generously with the garlic clove. Thickly smear each piece of bread with the fresh herbed cheese. Spoon the tomatoes and their juices onto the slices of bread. Coarsely chop the herbs for the garnish, and scatter them over the top of each portion. granddaughter did a wonderful job. You had some good eats there, Kathy. Homemade herbal yoghurt spread and those oatmeal cookies are totally right up my alley. 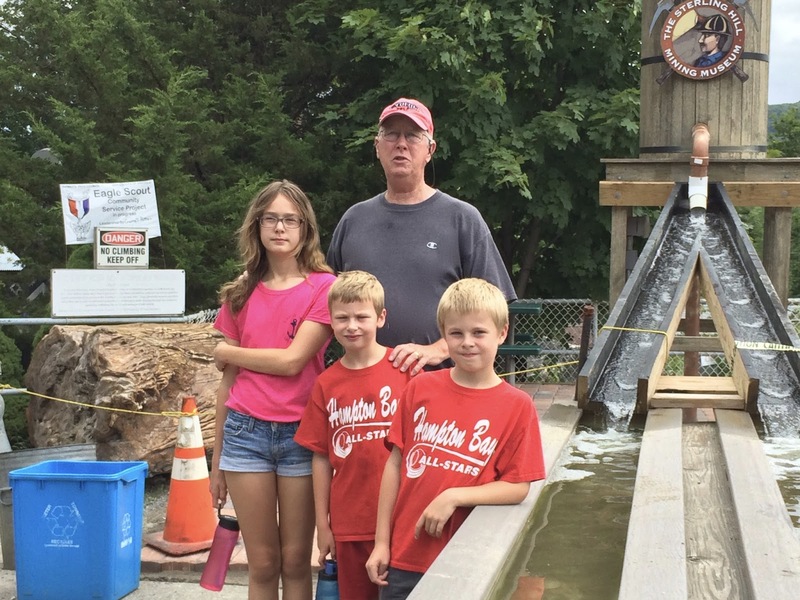 Sounds like you had a great time with the grandkids! And the crositini and cookies look delicious! Wish I had one of both now. I know you always look forward to this week and am glad the heat didn't lessen the fun. Even I would live to tour that mine. 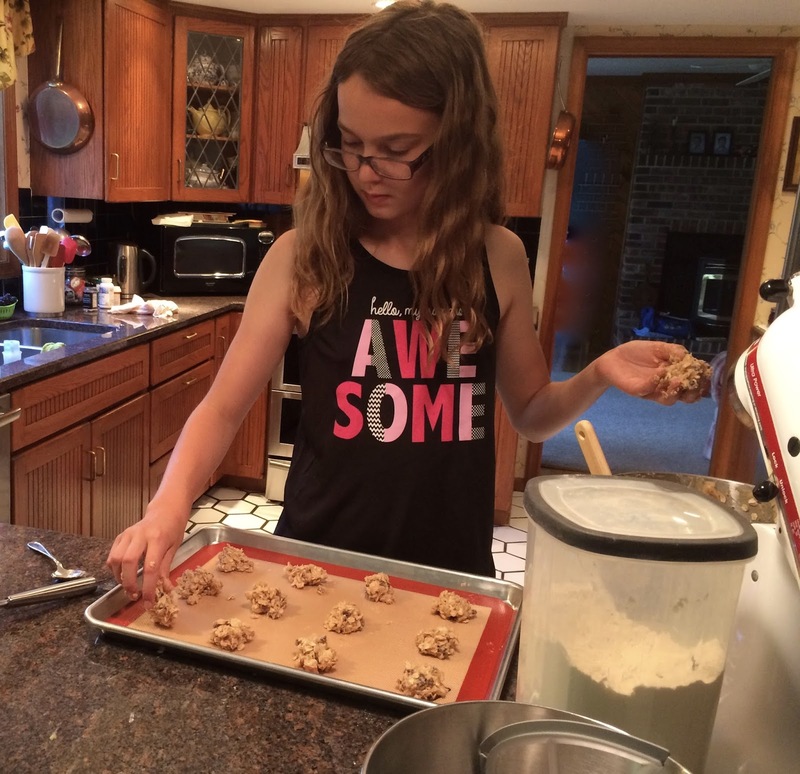 Josie's oatmeal-chocolate chip cookies look delicious as does her photo. Yep, takes after her grandmother. I've already made these roasted tomatoes twice. A winner for me also. I want to go to grandparents camp:) Those mine pictures look cool. I thought that this crostini recipe looks good. 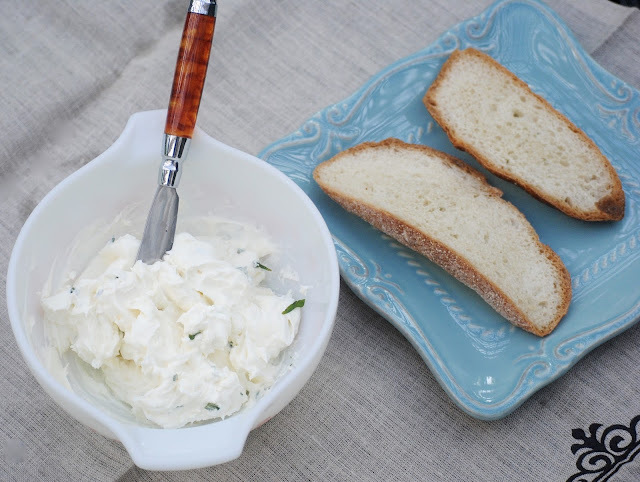 The strained yogurt goat cheese looks amazing. Can't wait for this weekend's market to get some fresh goat yogurt to try this! What a lovely post! Great photos! A lovely time everyone had in this post. Lots of fun, and food! Gorgeous photos, Kathy! That's so sweet that your granddaughter takes after you - her food styling is great, too! I have so many cherry tomatoes ready for plucking. I'm going to roast another batch and see if I can find some goat yogurt (rather than the water buffalo yogurt I used for the post) to make this all over again.